Old and historic, Zlatoust is one of the most beautiful and visited towns in the southern Ural Mountains. It is the heartland of weapons manufacturing, the art of steel engraving and features one of the highest mountain trams in the world, ferrying people through forests and alongside alpine peaks. Zlatoust (1,631 kilometers east of Moscow) was founded in the heart of the Ural Mountains in 1754. Today this town (population: 170,000) is surrounded by natural parks and the remarkable mountain massifs of the Taganay, nicknamed “the Ural Tyrol” after the beautiful ski area in Austria. Situated on the border between Europe and Asia it is considered the highest mountain town in the Urals. Zlatoust has attracted notable travelers for more than three centuries. Russian leaders ranging from tsars Alexander I and Nicholas II, peasant commander Yemelyan Pugachev and the “Supreme Ruler of Russia” Alexander Kolchak, the White Army leader during the Russian Civil War, all passed through the area. Famous Germans such as zoologist Peter Simon Pallas and explorer Alexander von Humboldt have also been guests. In Russia there are dozens of companies that produce decorative cold weaponry, but it was here that this technology was first mastered by Russian craftsmen. The first weapons factory in Zlatoust opened in 1815 to produce cold weaponry for the Russian army and navy. Zlatoust remains one of the world-class centers of knife production to this day. There are about 60 cooperatives and workshops specializing in producing white weapons (a white or cold weapon is one that does not involve fire or explosives). One of the most important centers is the Oruzheynik factory (its name means “maker of arms”), where a whole range of long-blade weapons is produced including sabers, swords, longswords, hunting knives, dirks, stilettos. The Oruzheynik factory organizes excursions that show the different phases of cold weaponry production and the depth of variety of swords and knives decorated with precious stones. One of Zlatoust’s most popular souvenirs is the branded saber. Souvenir weapons can be taken across borders provided that you show the receipt and certificate. Make sure to get the product’s certificate identifying it as a souvenir at the time of purchase. After visiting the Oruzheynik factory go to the top of the town’s highest building, the Ioann Zlatoust Tower (42 meters tall), named after the town’s patron saint. Next head to the “Chernykh skal” (Black Rocks) platform located at an elevation of 853 meters. One of the most popular places in Taganay National Park (15 kilometers from Zlatoust), from here you can enjoy a wonderful view of the mountains. On the slope of the Urenga Range, which begins within the city limits, is the old “Berezovaya roshcha” (birch grove) cemetery where the graves of German weapon artisans have been preserved. Next to it is the Zlatoust Local History Museum featuring a collection of old damask steel weapons. The museum’s exhibitions display ancient icons, iron castings and the decorated weaponry of Zlatoust masters from the first half of the 19th century, as well as contemporary craft weapons in accordance with the Zlatoust school of metal engraving. The museum provides tours in English. Getting around by tram is an excellent way to see everything Zlatoust has to offer. The tram here is said to be the steepest and highest mountain tramway in Europe: the slope of the tram reaches an incline of almost 50 percent at times. The idea to set up a tramway in Zlatoust, which lies in a valley, was worked out in the town’s 1928 general development plan; the network was launched in 1934. The tram goes up and down an endless series of hills, it climbs the mountains’ slopes, zigzags along the foot of rocks, across ponds and forests’ edges and rolls through country landscapes. The tram tracks circumvent the entire town and for 18 rubles for the ticket (less than $0.50) you can have an unforgettable excursion through the city filled with sharp impressions: in some parts of the railway the tram almost vertically climbs the slope. 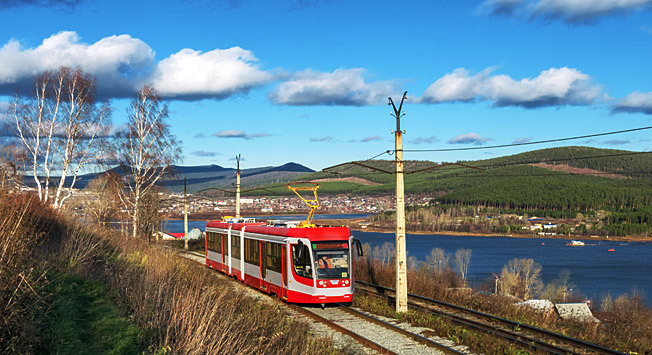 From the tram you’ll see the landscapes of the Taganay Mountain Range; the Alexandrovskaya mountain, one of the peaks of the Ural Range; Kosotur, the highest point in Zlatoust; the alpine river Ay; and all of the town’s main sights.